5 Options To Better Protect Your Store | Calgary Alarm Inc. Theft can have a serious impact on your bottom line. Not only is it money taken directly out of your pocket, it can throw off your inventory management and establish your name and your store as ones that are easy to rip off because there are no measures in place to stop it. The biggest deterrence for a potential thief is the knowledge that he is being watched. If someone thinks there is a chance that they will be caught in the act, or that their face will be captured on camera doing something which will get them into trouble, they are much less inclined to go ahead with something immoral or illegal. 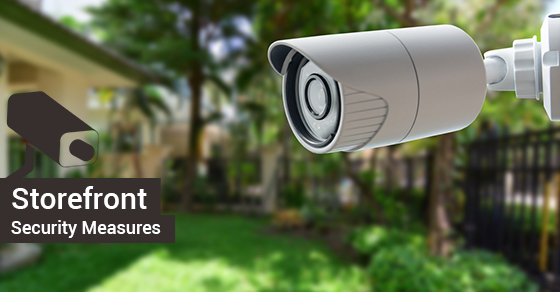 Not only are traditional security measures like locks, gates and deadbolts important, but secondary electronic measures like pressure or break-sensitive alarm systems which alert the authorities, and outdoor, motion sensitive lighting which expose would-be thieves are necessary additional measures. Strong locks, on top of mitigating the chances of unwanted entry, mean that to bypass them, a thief would need to use a high degree of force to break in. This is key when pursuing insurance claims as most insurers will look for proof of forced entry to satisfy any insurance policy payout clauses. Make sure your safe is heavy duty. A file cabinet with a padlock on it is not a safe. Protecting your cash and other valuable paper in an e-safe will not only make it more difficult to actually break into, but again, will be directly related to the insurance premiums and conditions on payouts you should expect to pay and receive. Any glass with a high tensile strength which allows it to take and absorb heavy impacts is useful to have in areas where shop windows or glass doors are potential points of entry. Most burglar resistant glass is comprised of two pieces of strong glass with a piece of heavy-duty plastic wedged in between for extra protection. This glass is not indestructible and with some time and effort, can be broken, but it is shatterproof and the hole made in it will be filled with jagged pieces of glass and plastic. Protecting your storefront and livelihood deserves time, attention and funds. The importance of having a budget to make sure your business and property is protected cannot be overstated. The lost time and income that you will have to deal with as a result of a serious break-in far outweighs the cost of prevention and peace of mind it affords you. Consider the above 5 security options to better protect your store, and contact our team for more information!